bulla with an impression of the string. A bulla is a hardened clay seal impression. When an official document was written on papyrus, it would be rolled and folded into thirds and tied with a string. A lump of clay would be pressed into the string and impressed by a seal from the signet ring of the writer or official. Dried with the seal's impression, the bulla would guarantee the validity of the document while in transient as a message or in archival storage. Conflicts involving destructive fires hardened the bullae so that they were impervious to normal erosion and decay; thus, hundreds of bullae have been recovered by archeological excavations and clandestine diggers. In many instances the underside of the bullae still has remains of the embedded strings. In 2005, while excavating the platform above the Stepped Stone Structure, Israeli archeologist Eilat Mazar uncovered a small section of wall believed to be the Palace of David. Inside this wall, her team discovered a bulla. The bulla was translated as, "Yehuchal (or Jehucal) ben Shelemyahu (Shelemiah)". Jucal the son of Shelemiah is mentioned twice in the Bible as an official to king Zedekiah (Jer 37:3; 38:1), and one who would be in the royal palace and in possession of a bulla. In 2008, in the course of repairing a collapsing tower, believed to be Nehemiah's Northern Tower, Eilat Mazer was excavating near the top of the Stepped Stone Structure and discovered a bulla just outside of the small section of wall where the Jehucal Bulla was found. 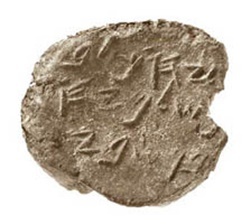 This bulla was translated as, "Gedalyahu (Gedaliah) ben Pashur." Gedaliah the son of Pashhur is mentioned once in the Bible (Jer 38:1) in conjunction with Jucal the son of Shelemiah as an official to king Zedekiah. He too would be in possession of a bulla. Biblical accounts record Jehucal son of Shelemiah and Gedaliah son of Pashhur as two officials of king Zedekiah who disagreed with Jeremiah’s prophetic message, and in response, imprisoned Jeremiah in a cistern to die (Jer 38:1-6). Not only significant for confirming the existence of two Old Testament figures, the 2,600 year old Jehucal Bulla and Gedaliah Bulla indirectly confirm the historical existence of the prophet Jeremiah. Jeremiah, the author of the books Jeremiah and Lamentations, was a major prophet during the decline and fall of the southern kingdom of Judah. Prophesying about 40 years during the reigns of the last five kings of Judah, Jeremiah began his ministry in the 13th year of Josiah's reign (626 B.C.) until the capture of Jerusalem by the Babylonians in the 11th year of Zedekiah’s reign (586 B.C.). Chosen by God (Jer 1:5-10) to confront His people, Jeremiah warned the nation of Judah of their covenant rebellion and exhorted their return to God. Salvation was through God not by military alliances with Assyria, Egypt or Babylonia. 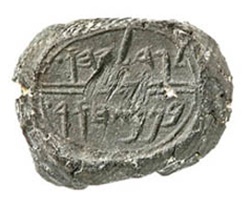 Later in 1996, a second bulla was found with an identical impression indicating that it was made with the same seal. Also impressed was a partial fingerprint which many speculated at the time as the actual fingerprint of Baruch himself. However, by 2004, these two Baruch bullae were decisively determined to be forgeries based on clear paleographic anomalies and technical errors in the production of the bullae. By directly confirming the historical existence of characters mentioned in the book of Jeremiah and within the appropriate dating and proven provenance, the Jehucal Bulla and Gedaliah Bulla indirectly confirm the historicity of the prophet Jeremiah and a basis supporting the view of his work as non-fiction. This is significant, because through Jeremiah, God reveals the New Covenant. 2. "Jeremiah, Prophet of the Bible, Brought Back to Life", from the website Bible History Daily. 3. 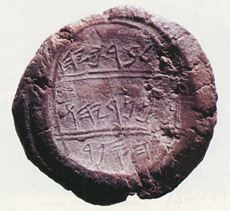 From the website: TheTrumpet.com: "Royal Seal of Prophet Jeremiah’s Accuser Found." 4. Rollston CA, "The Bullae of Baruch ben Neriah the Scribe and the Seal of Ma‘adanah Daughter of the King: Epigraphic Forgeries of the 20th Century" in ERETZ-ISRAEL Archaeological, Historical and Geographical Studies, vol 32, Jerusalem: The Israel Exploration Society (2016).